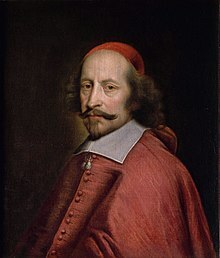 Cardinal Jules Mazarin (French: [ʒyl mazaʁɛ̃]; 14 July 1602 – 9 March 1661), born Giulio Raimondo Mazzarino [ˈdʒuːljo raiˈmondo madːzaˈriːno] or Mazarini, was an Italian cardinal, diplomat and politician, who served as the chief minister to the kings of France Louis XIII and Louis XIV from 1642 until his death. In 1654 he acquired the title Duke of Mayenne, and in 1659, 1st Duke of Rethel and Nevers. 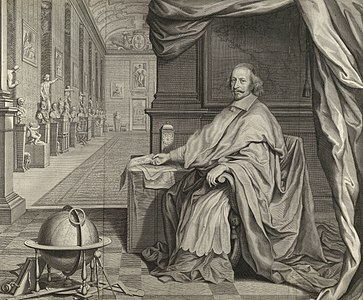 After serving as a papal diplomat for Pope Urban VIII, Mazarin offered his diplomatic services to Cardinal Richelieu and moved to Paris in 1640. Following the death of Richelieu, Mazarin took his place as first minister, and after that of Louis XIII in 1643, Mazarin acted as the head of the government for Anne of Austria, the regent for the young Louis XIV, and was also made responsible for the king's education until he came of age. 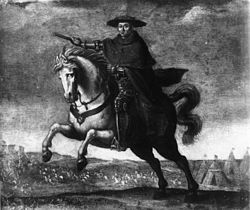 The first years of Mazarin in office were marked by military victories in the Thirty Years' War, which he used to make France the main European power and establish the Peace of Westphalia (1646–48). A major uprising against Anne of Austria and Mazarin, called the Fronde and led by the nobles of the Parliament of Paris, broke out in Paris in 1648, followed by a second Fronde led by Louis, Grand Condé, who turned from his chief ally to his chief enemy. Mazarin took Anne of Austria and Louis XIV out of Paris, and then shifted his base to Germany for a time. 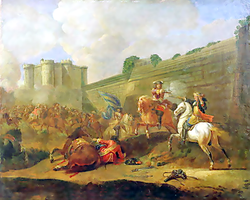 Turenne, a general loyal to Louis XIV and Mazarin, defeated Condé, and Mazarin made a triumphal return to Paris in 1653. The last years of Mazarin's life, between 1657 and his death in 1661, were marked by a series of major diplomatic victories, In 1657 he made a military alliance with England. In 1658 he unveiled the League of the Rhine, a new group of fifty small German principalities which were now linked by a treaty with France. In the same month, Marshal Turenne decisively defeated the army of Condé at the Battle of the Dunes in Flanders. Between February and June 1659, Mazarin conducted intensive negotiations with the Spanish. On 7 November 1659 Spain signed the Treaty of the Pyrenees, which added Artois, the Cerdagne and Roussillon as new provinces of France. This was followed in June 1660 by an even more important diplomatic event carefully arranged by Mazarin; the marriage of Louis XIV with Maria Theresa of Spain. The marriage took place in Saint-Jean-de-Luz in Spain, close to the French border. The couple made a triumphant entry into Paris on 26 August 1660. This marriage and accompanying agreements ended, at least for a time, the long and costly wars between the Hapsburgs and France. Exhausted by his diplomatic efforts, Mazarin died on 9 March 1661. Mazarin, as the actual (de facto) ruler of France, played a crucial role in establishing the Westphalian principles that would guide European states' foreign policy and the prevailing world order. Some of these principles, such as the nation state's sovereignty over its territory and domestic affairs and the legal equality among states, remain the basis of international law to this day. In addition to his diplomacy, Mazarin was an important patron of the arts. He introduced Italian opera on a grand scale to Paris, and assembled a remarkable art collection, much of which today can be seen in the Louvre. 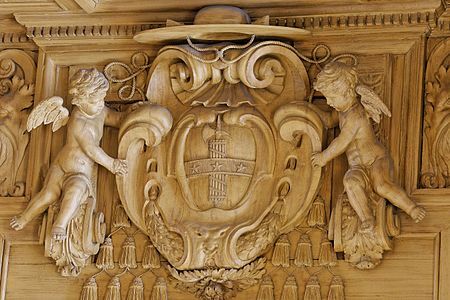 He also founded the Bibliothèque Mazarine, the first true public library in France, which is now found in the Institut de France, across the Seine from the Louvre. Giulio Mazzarino was born on 14 July 1602 in Pescina in the Abruzzo province of Italy, about one hundred twenty kilometers from Rome. His parents were residents of Rome, spending the summer in Pescina to escape the summer heat. 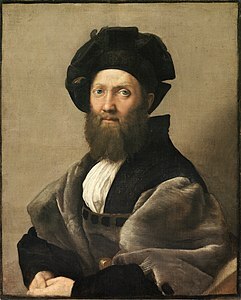 His father, Pietro Mazzarino, had moved to Rome from Sicily in 1590 to become a chamberlain in the family of Filippo I Colonna, the Grand Constable of Naples. His father became a citizen of Rome in 1608. His mother was a native of Rome, from a family of the nobility whose origins were in Città di Castello in Umbria. The family had moved to Rome in the Middle Ages. She was the goddaughter of Filippo I Colonna, her husband's employer. Giulio was the oldest of six children, two boys and four girls. Through the influence of the Colonnas, Giulio was admitted at the age of seven to the Jesuit College in Rome, the most respected school in the city. Though he declined to join their order, he excelled in his studies. In 1618, at the age of sixteen, he gave a public lecture on theories explaining Halley's comet, which appeared in that year. He also excelled in theatrics; he was chosen to play the part of the newly-sainted Ignatius of Loyola in a religious pageant. He also acquired the habit of gambling at cards, and frequently was in debt. When he was twenty his father decided to send him away from the bad influences of Rome. Giulio accompanied Girolamo Colonna, one of the sons of Filippo I Colonna, who was eighteen, to the Complutense University of Madrid (then located in Alcalá de Henares) in Spain. He studied law with Girolamo during the daytime and in the evenings continued to gamble and again was in debt. A notary who had advanced some cash to cover gaming debts urged the charming and personable young Mazarino to take his daughter as bride, with a substantial dowry, and Giulio accepted. Girolamo Colonno wrote urgently to his father in Rome, and Giulio was ordered to return immediately to Rome, without his fiancée. Upon his return to Rome, he resumed his studies, this time in law. In 1628 he received the title of doctor in utroque jure, meaning he could practice both civil and canonical law. In the same year Ferdinand II, the Hapsburg emperor, laid claim to a papal territory, the Valtellina, in the Italian alps. Pope Urban VIII raised an army to defend his territory. The Prince of Palestrina, who was also a member of the Colonna family, commanded a new regiment of the Papal army, and invited Giulio to become a lieutenant in the regiment. Since neither the regiment nor Giulio had any military experience, they were assigned to a town far from the front line. Giulio knew little of military discipline. He received a message from Rome informing that his mother was seriously ill. Without asking permission from his commander, he immediately rode to Rome, and stayed there until mother had recovered. He was summoned before the Pope, Urban VIII, to explain why he had deserted his post. He threw himself at the feet of the Pope, and pleaded to be pardoned for his excess of loyalty to his family. The Pope was impressed by Giulio's spontaneity and eloquence, forgave his desertion, and invited him to become a Papal emissary. In 1628 Mazarin was named the secretary to Jean-François Saccchetti, a senior papal diplomat, who was trying to prevent the impending War of the Mantuan Succession between the armies of France and Spain for dominance of that region of northern Italy. Throughout 1629 and 1630 he shuttled between Milan, Mantua, Turin, Casal and France, trying to find a solution to the crisis before the fighting began. This became, throughout his career, his standard method of diplomacy; traveling continually, getting to know and win the trust of as many decision-makers as possible. During this time he came to know Cardinal François Barberini, the head of diplomacy for the Vatican, and, more important, Cardinal Richelieu of France, his future mentor, whom he first met in Lyon on 29 January 1630. Richelieu was aloof and confrontational; he wrote afterwards: "This Mazarini is here more to spy than to negotiate....He is so Spanish and so Savoyard that what he says shouldn't be taken as gospel truth." Richelieu at first decided to ignore Mazarin's diplomacy and to send the French army across the Alps into Italy. On 26 October 1630 the French and Spanish armies met outside the walls of the French-held town of Casal, ready to fight. Suddenly, a man on horseback with a flag appeared, galloping toward them, crying "Pace! Pace!" ("Peace! Peace!") It was Mazarin, carrying an agreement from the Spanish commander to evacuate their soldiers from the town if the French would leave Montferrat to Charles Gonzaga, Duke of Mantua. Mazarin brought together the Spanish and French commanders and explained the terms of the agreement, which were readily accepted by both sides. Mazarin had achieved his first diplomatic success. The result of Mazarin's first diplomatic efforts was the Treaty of Cherasco, 6 April 1631, in which the Emperor and the Duke of Savoy recognized the possession of Mantua and part of Monferrat by Charles Gonzaga and the French occupation of the strategic stronghold of Pinerolo, the gate to the valley of the Po, to the great satisfaction of Richelieu and King Louis XIII of France. The Pope sent Mazarin to Paris at the beginning of 1631 to work out the final details of the agreement. He returned to France again from April to July 1632. He had his first interview with Lous XIII and with the Queen, Anne of Austria, in May 1632. He tried to persuade Louis XIII to send a military expedition to capture Geneva, the fortress of the Protestant movement, but the King, who had good relations with the Swiss cantons, rejected the idea. Mazarin returned to Rome in November 1632, and made a new friend and ally, Antonio Barberini, the nephew of the Pope and one of his chief diplomats, and his older brother, François Barberini, the State Secretary of the Vatican. With their assistance, he established himself as a guardian of French interests at the Vatican, and then of Vatican interests in France. in 1632, he was named papal vice-legate at Avignon, and given the religious title of prelate, and began to wear an ecclesiastical costume, though he was not and never became a priest. While in Rome, Mazarin sent regular gifts of flowers, perfumes and delicacies to the women of the French court, and more valuable gifts, including statues and Renaissance paintings, to Richelieu. In 1634 he was named nuncio extraordinary to Paris by Urban VII, with the mission of persuading Louis XIII to undertake a grand naval crusade against the Turks. The goal was to create a combined fleet of the ships of Christian nations to seize the Turkish ports around the Mediterranean. Mazarin, a realist, knew that, given the rivalries between European powers, this project would never take place. A new crisis arrived on 19 May 1635; France declared war on the Hapsburg rulers of Austria and Spain. Mazarin wrote later that he had done his best to persuade Richelieu to avoid a war. He wrote that in March 1635 he gave Richelieu all his reasons to maintain the peace. "His Eminence told me, in standing up," Mazarin wrote, "that I courted Peace as if she were the woman of my dreams. Then he shook my hand, and concluded, 'You are no longer on the side of France. '"Mazarin left Paris for Aviginon on April 7, 1636. During all of his negotiations, Mazarin was very careful not to be too critical of the French court and Richelieu, and they remained in contact. In November 1636 he left Avignon to return to Rome, carrying instructions from Richelieu that made him a discreet ambassador for the king of France. The atmosphere within the Vatican was hostile to France and to Richelieu; Spanish priests occupied many positions in the hierarchy and they considered him, with reason, an agent of France. When the Pope refused to send him back to France, or to represent the Vatican at a peace conference, he wrote: "I am not a subject of the King of France, but I believe I can truly say that the declarations of the Spanish have declared me to be French, so that with justice one can say that France is my country." His position in Rome was increasingly difficult. He had the affection of Pope Urban VIII, but he was disliked by Cardinal Barberini, the chief of Papal diplomacy, and by the large contingent of Spaniards in the Vatican household. He spent his time collecting sculpture and other works of art which he sent to Richelieu for the Cardinal's new palace in Paris. He considered serving the rulers of Savoy, Poland, or Queen Henriette of England, but in the end he decided to enter the service of Richelieu and France. However, Richelieu was in no hurry to bring him to Paris; he valued the diplomatic contributions Mazarin was making in Rome, as well as the art treasures he was acquiring. He kept Mazarin in Rome for two more years. 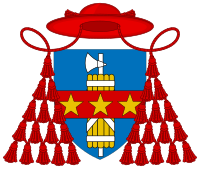 Richelieu did one important favor for Mazarin; in October 1638 he put forward Mazarin's name as a candidate for Cardinal when the next vacancy opened up. In December 1638, when a sitting Cardinal died, Mazarin was nominated as a Cardinal. He had to wait the entire year of 1639 before his new position was confirmed. Then on 14 December 1639, he departed Rome for the port of Civita Vecchia, boarded an armed French ship to Marseille, and then traveled from Lyon to Paris, where he arrived on 5 January 1640. When he arrived in Paris, Mazarin was welcomed warmly by the King, by Richelieu, and by the Queen, Anne of Austria, to whom Mazarin had regularly sent perfumes, fans, gloves and other gifts. The Queen was at this time pregnant with her second child, and it was already anticipated that she would be the regent when King Louis XIII died. He advised Richelieu on both political and cultural matters. He recommended artists to bring from Rome to Paris, and in 1640 he commissioned a bust of Richelieu from the sculptor Bernini in Rome, sending Bernini pictures of Richelieu. The bust of Richelieu arrived in August 1641. Mazarin declared that it was perfect, so lifelike that, as he wrote, "it seemed about to speak", but French tastes did not approve of the Baroque style. The other members of the Court condemned the work, and Mazarin wrote back to Bernini, sending him more pictures of Richelieu and asking him to try again. He had established a cordial relationship with Richelieu; Richelieu jokingly referred to him as Rinzama (an anagram of his name), or Nunzinicardo ("dear little envoy), or, most frequently, Colmarduccio, or Colmardo. When was asked what it meant. he translated into French as Frére Coupechou, the term for a junior candidate monk who was assigned to chop cabbage in the kitchen of the abbey. However, he did not send Mazarin on the mission that he most wanted, as delegate of France to a Europe-wide peace conference. Richelieu's attention was devoted to making war; Richelieu, who was elderly and in poor health, took the King, who was also in poor health, the court and Mazarin on a series of long military expeditions, to suppress a rebellion in Catalonia, to capture Roussillon, and, in January 1642, to lay siege to Narbonne. On June 11, 1642, while in Tarascon on one of the long military expeditions, he was presented with evidence that Gaston, Duke of Orléans, the brother of Louis XIII, and The Marquis of Cinq-Mars, one of the King's closest advisors, had made a secret agreement with the King of Spain, without the knowledge of Richelieu or the King. It appeared probable that the Queen, Anne of Austria, was also aware of this secret betrayal of Richelieu, but did not tell him or the King. Cinq-Mars was arrested, Gaston was disgraced, and another conspirator, the Duke of Bouillon, was granted a pardon on the condition of revealing all the details of the plot to Mazarin, and surrendering the important fortress of Sedan to the King. Mazarin did not reveal the participation of the Queen in the conspiracy, but his knowledge gave him even greater leverage at the court. The destruction of the conspiracy against the King was one of the last acts of Cardinal Richelieu. He fell ill and died on 4 December 1642. The Will of Louis XIII stated that his wife, Anne of Austria, would not be his regent after his death. His heir, the future Louis XIV was then only five years old. However, she immediately went to the Parliament of Paris, an assembly of nobles friendly to her, and had his will declared invalid. The management style of Mazarin was entirely different from that of Richelieu. The contrast was described by Cardinal Retz, the future enemy of Mazarin, in his Memoires: "One saw on the steps of the throne, where the sharp and fearsome Richelieu had thundered rather than governed the people, a leader who is gentle, benevolent, and demands nothing...He has the spirit, the insinuation, the playfulness, the manners, but also a certain laziness...."
Mazarin's policies also added Alsace (though not Strasbourg) to France. He settled Protestant princes in secularized bishoprics and abbacies in reward for their political opposition to the Habsburgs, building a network of French influence as a buffer in the western part of the Empire. In 1657, he made an attempt to get Louis XIV elected as Holy Roman Emperor. In 1658 he formed the League of the Rhine, which was designed to check the House of Austria in central Germany. In 1659 he made peace with Habsburg Spain in the Peace of the Pyrenees, which added to French territory Roussillon and northern Cerdanya—as French Cerdagne—in the far south as well as part of the Low Countries. Towards Protestantism at home, Mazarin pursued a policy of promises and calculated delay to defuse the armed insurrection of the Ardèche (1653), for example, and to keep the Huguenots disarmed: for six years they believed themselves to be on the eve of recovering the protections of the Edict of Nantes, but in the end they obtained nothing. There was constant friction with the pontificate of the Spanish Cardinal Pamphilj, elected Pope on 15 September 1644 as Innocent X. Mazarin protected the Barberini cardinals, nephews of the late Pope, and the Bull against them was voted by the Parlement of Paris "null and abusive"; France made a show of preparing to take Avignon by force, and Innocent backed down. Mazarin was more consistently an enemy of Jansenism, in particular during the formulary controversy, more for its political implications than out of theology. On his deathbed he warned young Louis "not to tolerate the Jansenist sect, not even their name." After his death, Louis XIV did not appoint a new principal minister and instead governed himself, marking the beginning of a new era of centralized government in France. Mazarin's long war against the Hapsburgs, the final part of the Thirty years war, was successful, but the cost was enormous. Resentment grew against the Spanish Queen and her Italian prime minister, and culminated in the Fronde, a rebellion against the government by members of the nobility and discontented citizens of Paris, which lasted from 1648 until 1653. An anti-Mazarin cartoon from the Fronde (about 1650). The caption reads, "Despite Mazarin, the frondeurs assure the safety of the state." The center of resistance was the Paris parlement, an ancient assembly of nobles which served as a high court of appeals. It was a period of rebellion against monarchs across Europe; independence movements appeared in the Spanish provinces of Catalonia and Portugal, a revolutionary seized power in Naples, and Charles I of England, the brother-in-law of Louis XIII, was deposed and executed in 1649. In Paris, the members of the parlement called a special session to debate Mazarin's measures. The meeting was forbidden by Regent, Anne of Austria, but went ahead anyway. The parlement issued a charter, inspired by the writ of Habeas Corpus in England, which revoked the authority of the King's justice officials, forbade any new taxes without the approval of the parlement, and declared that no royal subjects could be imprisoned without due process of law. During the Fronde, the anti-Mazarin crowds of Paris enjoyed listening to Mazarinades, popular songs with verses mocking the Cardinal. Dozens were written and published, accusing him of virtually all possible faults and crimes. Mazarin had a sense of humor, and when the Fronde was finished, he had the best Mazarinades collected and performed in a concert at his palace. The Parlement accepted Mazarin and his government, but the Fronde was still not finished. Many frondeurs were unhappy with the compromise reached in 1649. Condé was a brilliant general but a poor politician. Once in Paris, he made endless demands on Anne of Austria until she finally angrily dismissed him. One of the other leaders of the Fronde, Jean François Paul de Gondi, soon persuaded Condé to join him in bringing down both Mazarin and Anne of Austria. Mazarin had an excellent network of agents, and immediately learned of the plot. On 18 January 1650 Mazarin had Condé, Condé's brother, Armand de Bourbon, prince de Conti and his brother-in-law, Henri II d'Orléans, duc de Longueville arrested. The agreements of 1649 had brought peace to Paris, but the unrest of the Fronde continued in other parts of France, Opponents of Mazarin disrupted tax collection and administration. As the rebellion grew, Mazarin observed that the rebels were only united in opposition to him. He decided it was wisest to resign his position and leave France while he could. He had Condé freed from prison, and, after a long journey to different cities, settled at the Château de Bruhl near Cologne, as the guest of the Archbishop-Elector of Cologne. Once back in Paris, Mazarin soon made an alliance with his old enemy, the Cardinal Gondi. Condé departed to Bordeaux to gather reinforcements. He raised an army of Spanish and French soldiers, and marched on Paris, arriving on 2 July. The soldiers loyal to the Queen, commanded by Turenne, were waiting, and trapped Condés' army against the walls of Paris. An ally of Condé, the Grande Madamoiselle, ordered the gates of the city opened to rescue Condés army. The battle was witnessed from the hills of Charonne by the young Louis XIV. As soon as Condé's soldiers entered Paris, he demanded an immediate purge of Mazarin's supporters. Riots broke out around the Bastille, and were suppressed with great difficulty. The Presidents of the Parlement, now allies of Mazarin, demanded that the violence be stopped and that Condé take his army out of Paris. Reluctantly, Condé left the city, going to the Spanish Netherlands, pursued by Turenne. Following the death of his first finance minister, La Vieuville, on 2 February 1653, Mazarin chose a new minister, Nicolas Fouquet, At the age of twenty-five, Fouquet had inherited a very large fortune after the death of his young first wife, and an even greater fortune when he married the second time, to Marie-Madeleine de Castille, whose family was one of the wealthiest in Europe. Fouquet began as a master of receipts at age twenty, then an intendant to the army, then Procuror-General for the Parliament of Paris at the age of thirty-five. The great rival of Fouquet was Jean-Baptiste Colbert, who was also recommended to Louis XIV and brought into the government by Mazarin. Soon after he became an assistant to Mazarin, he wrote a mémoire to Mazarin, claiming that of the taxes paid by the people, not one-half reached the King. The paper also accused Fouquet of using royal funds for his own enrichment. Mazarin did not defend Fouquet; shortly before his own death, he agreed that Fouquet had to go. Shortly after Mazarin's death, Fouquet was accused by Colbert of misuse of state funds, his property was confiscated, and he was put into prison until his death, with Colbert eventually taking his place. The personal fortune of Mazarin at the time of his death was immense, amounting to 35 million livres, not counting the sums he left to his nieces. It exceeded the second-greatest personal fortune of the century, that of Richelieu, worth some 20 million livres. About one third of the personal fortune of Mazarin came from some twenty-one abbeys around France, each of which paid him an annual share of their revenue. Unlike members of the nobility, he did not have any large estates; his only real estate was the palace in Paris which he purchased in 1649, and added several surrounding houses. It was valued at 1.2 million livres. Thirty-seven percent of his fortune was in easily transportable jewels and cash. Within the ebony cabinets of his rooms at the Louvre his heirs found 450 pearls of high quality, plus quantities of gold chains and crosses, and rings with previous stones, altogether adding another 400,000 livres. He left to his family jewels worth an estimated 2.5 million livres, and gave a collection of diamonds worth 50,000 livres to the new Queen, and a 14-carat diamond called The Rose of England, valued at 73,000 livres, to the Queen Mother. The most valuable legacies of all, including a set of eighteen diamonds known as the "Mazarins", worth two million livres, were given to the young Louis XIV. Mazarin was second only to Louis XIV as a patron of the arts in France in the 17th century. In 1648 he founded the Royal Academy of Painting and Sculpture. After his death in 1661, the inventory of his art collection at the Mazarin Palace recorded 858 paintings, 128 statues, 185 busts, plus 150 carpets, 514 pieces of jewelry and fine silver, and 317 precious stones, not counting the famous Mazarin diamonds, which he left to Louis XIV. His collection included works by most of the major French and Italian artists of his time and before, going back to the Renaissance. His acquisitions included works by Poussin, Rubens, Corregio, Van Dyck, Titian, and many others, as well as the famous Portrait of Baldassare Castiglione by Raphael, which had belonged to Charles I of England, and had been bought by Richelieu. Just before his death, he visited his gallery for the last time with his deputy Brienne, and told him: "Ah, my poor friend, I must leave all this. Farewell, dear paintings, which cost me so much and which I so much loved." Many of his paintings now are now in Louvre. The Palais Mazarin (Mazarin Palace) was created by Mazarin beginning in 1643, soon after he became first minister, when he rented four adjacent hôtels on the north side of the Rue Neuve-des-Petits-Champs between the Rue Vivienne to the east and the Rue de Richelieu on the west and across from the Palais Royal, which was the King's residence. He commissioned François Mansart to add a garden wing with two superimposed galleries running north from the west end of the easternmost building, the Hôtel Tubeuf, where he could display his art. Between 1645 and 1647 he commissioned the Italian painter Giovanni Francesco Romanelli to create scenes from the works of Ovid on the ceiling of the upper gallery (although much modified, now known as the Galerie Mazarine). In 1721, the Palais Mazarin became the site of the King's Library (Bibliothèque du Roi), now the Richelieu site of the Bibliothèque nationale de France. Mazarin spent little time in his Palace; he lived most of the time in the Palais Royal, when Louis XIV was in residence there, or in the Louvre. Near the end of his life he resided in the Château de Vincennes, where he decorated a suite of rooms. He also had the moats of the chateau turned into a kind of zoo, with lions, tigers, bears and other exotic animals, for the amusement of the young King. Due to Mazarin's efforts, seven Italian operas were performed in Paris between 1645 and 1662. In 1645 Mazarin brought to Paris the famous scenery designer Giacomo Torelli, who staged Sacrati's opera La finta pazza. 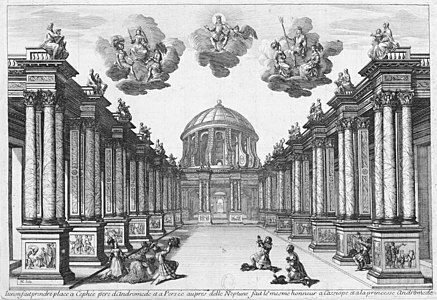 In 1647, for Carnaval, he staged a lavish production of the premiere of Orfeo by Luigi Rossi. Later on Torelli became involved more in the ballets de cour than in opera, reflecting the passion of the king for dancing. Torelli's career in France came to a definitive end in 1661, when he worked on sets for Molière's Les fâcheux, presented by Nicholas Fouquet as part of his grand fête at Vaux-le-Vicomte in honor of the King, the overly ostentatious display which ultimately led to Fouquet's imprisonment. The Wedding of Louis XIV with Marie-Therese of Austria. Mazarin is at their right. Beginning in 1659, as the King reached the age of twenty-one, and Mazarin approached the end of his life, his wrote a series of guidelines in political affairs for the King. When the King set off on his journey to Spain to be married, Mazarin wrote to him: "Remember, I ask you, what I have had the honor to tell you, when you asked me the way to take to become a great King....it is necessary to begin by making the greatest efforts to not be dominated by any passion....because, otherwise, if any misfortune arrives, regardless of what good will you have, you you will not be able to do what has to be done." The last years of Mazarin's life, between 1658 and his death in 1661, were marked by a series of major diplomatic victories, including the marriage of Louis XIV. In 1658, after long and intense preparation, Mazarin unveiled the League of the Rhine, a new group of fifty small German principalities which were now linked by a treaty with France. They promised not to allow enemy forces pass through them to invade France. This treaty weakened both the old Holy Roman Empire and the Austrian Empire of the Hapsburgs, This gave a new measure of security to France's eastern border. Mazarin, as the de facto ruler of France, played a crucial role in establishing the Westphalian principles that would guide European states' foreign policy and the prevailing world order. Some of these principles, such as the nation state's sovereignty over its territory and domestic affairs and the legal equality among states, remain the basis of international law to this day. In his last months, Mazarin mostly resided in the Louvre Palace, A large fire broke out in the Gallery of Apollo, the main picture gallery of the Louvre, and destroyed many pictures, greatly upsetting Mazarin. It was the beginning of his decline. When his doctor informed him that his end was near, Mazarin asked, "How long?" The Doctor replied "two months." Mazarin responded, "That's enough." Mazarin had already prepared several wills. Knowing that his enemies at court were telling Louis XIV that he Mazarin taking money that belonged rightfully to the King, his first will, which he made public, cleverly left all of his fortune to Louis XIV. Mazarin most likely calculated that the King would be too embarrassed to take all of his mentor and chief Minister's wealth. The King did three days, then refused to accept it. Mazarin had prepared a different will, which left a large sum for the establishment of the Collège des Quatre-Nations, which he founded for students coming from the four new provinces which Mazarin and added to the territory of France through the Treaty of Westphalia. The College, now the Institut de France, was eventually built directly across the Seine from the Louvre, where it is visible from the Palace. Mazarin asked that his remains be interred there, where they are found today in a marble monument beneath the dome. The College now is home to the five French academies, including the Academie Française. 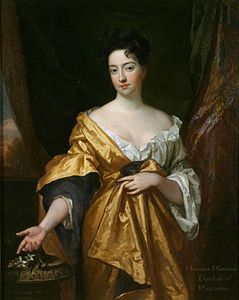 Marie-Anne Mancini,who became Duchess of Bouillon. Mazarin did not have children, but he did have seven nieces: five from the Mancini family (daughters of his sister Girolama) and two from the Martinozzi family (daughters of his sister Laura). The nieces all moved to Paris, and Mazarin devoted care to arranging marriages for them, always with wealthy and aristocratic families. The nieces were known for the beauty, their wit and their ambition, and became known as the Mazarinettes. As for the two Martinozzi sisters, Anne Marie Martinozzi married the Prince de Conti in 1654. Her sister Laura Martinozzi married Alfonso IV d'Este, Duke of Modena, and was the mother of Mary of Modena, who became queen consort of England as the wife of James II. Mazarin is a major character in Alexandre Dumas' novels Twenty Years After and Le Vicomte de Bragelonne. In them, Mazarin is portrayed as greedy and devious, as well as the Queen's lover. Cardinal Mazarin is an important supporting character in Rafael Sabatini's novel The Suitors of Yvonne. His plans set the main plot of the book in progress. He is portrayed fairly accurately as being ambitious and ruthless, but very protective of his family. 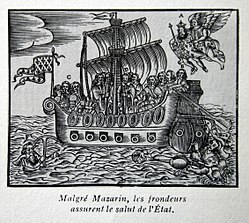 Mazarin is a character of some importance in 1634: The Galileo Affair by Eric Flint and Andrew Dennis, and also in 1636: The Cardinal Virtues by Eric Flint and Walter H. Hunt. The "Mazarin diamond" is searched for in a November 1899 Sherlock Holmes mystery by Arthur Conan Doyle, The Mazarin Stone. Mazarin is a major character in the 2005 series Young Blades, portrayed by Michael Ironside. Mazarin (played by Gérard Depardieu) serves as the mastermind antagonist in the Hallmark movie La Femme Musketeer. Personality- and ambition-wise, he is nearly identical to Cardinal Richelieu. Umberto Eco's novel The Island of the Day Before takes place just after the transition from Richelieu's rule to Mazarin's. Its protagonist witnesses the death watch for Richelieu and is subsequently forced by Mazarin to undertake a bizarre mission to the other side of the world. Mazarin plays a central role in the play Vincent In Heaven, which tells the story of St. Vincent DePaul. Mazarin is a character in the French TV series of the 1960s, Le Chevalier Tempête, shown in the UK as The Flashing Blade. He was played by the Belgian actor Giani Esposito. Mazarin is the antagonist of the novel "Enchantress of Paris" (2015) by Marci Jefferson. Mazarin uses the wiles of his niece, Marie Mancini, in an attempt to secure his power over the king. ^ For "Giulio Raimondo Mazzarino or Mazarini", see Dethan 1991, p. 979. For "Giulio Mazzarino", see Poncet 2018, p. 24. For the surname "Mazarini", see Mongrédien 1959, p. 9; Dethan 1977, p. 11; Treasure 1995, p. 404. Some sources give his surname as "Mazzarini", for example, Buelow 2004, p. 158 or Viaggio del Cardinale Mazzarini a St Jean de Luz l'anno 1659; others, as "Mazarino" (Dizionario italiano multimediale e multilingue d'Ortografia e di Pronunzia or Il cardinale Mazarino). ^ Poncet 2018, p. 24. ^ a b c d Mongrédien 1959, p. 10. ^ Mongrédien 1959, p. 11. ^ Poncet 2018, p. 32. ^ Mongrédien 1959, p. 13. ^ Mongrédien 1959, p. 14. ^ a b Mongrédien 1959, p. 16. ^ Mongrédien 1959, p. 22. ^ a b Mongrédien 1959, p. 38. ^ a b Mongrédien 1959, p. 24. ^ Poncet 1959, p. 24. ^ Mongrédien 1959, pp. 42–43. ^ a b c Mongrédien 1959, p. 45. ^ Mongrédien 1959, pp. 45–49. ^ Mongrédien 1959, pp. 47–49. ^ a b c Mongrédien 1959, pp. 50–51. ^ Mongrédien 1959, pp. 53. ^ O'Connor 1978, p. 5-9. ^ Jones, Colin (1994-10-20). The Cambridge Illustrated History of France (1st ed.). Cambridge University Press. p. 196. ISBN 978-0-521-43294-8. ^ This section draws upon the chapter Le vaincu de la Fronde deviant monarque absolu by Jacques de Bourbon Busset in Mazarin, edited by Georges Mongrédien (1959). ^ Mongrédien 1959, p. 54. ^ a b Mongrédien 1959, p. 56. ^ Mongrédien 1959, p. 56-58. ^ Mongrédien 1959, p. 59-60. ^ Mongrédien 1959, p. 60—61. ^ a b Mongrédien 1959, p. 60-61. ^ a b Mongrédien 1959, p. 75. ^ Mongrédien 1959, p. 76. ^ a b Goubert 1990, p. 434. ^ Goubert 1990, p. 439. ^ Goubert 1990, p. 439-443. ^ Goubert 438, p. 478. ^ a b Goubert 438, p. 439. ^ a b c Poncet 2018, p. 92. ^ Georges Dethan, "Mazarin, Jules, Cardinal" in The New Encyclopædia Britannica (15th edition, Chicago, 1991) vol. 7, p. 979. ^ Cosnac, Les richesses du palais Mazarin (1884). ^ Mongredien 1959, p. 113. ^ Thackray, Anne (1996). "Mazarin family (1) Cardinal Jules Mazarin [Giulio Mazarini]", vol. 20, pp. 895–896, , in The Dictionary of Art (34 vols. ), edited by Jane Turner. New York: Grove. ISBN 9781884446009. ^ Braham, Allan; Smith, Peter (1973). François Mansart, p. 71. London: A. Zwemmer. ISBN 9780302022511; Ayers, Andrew (2004). The Architecture of Paris, p. 58. Stuttgart; London: Edition Axel Menges. ISBN 9783930698967; Sauval, Henri (1724). Histoire et recherches des antiquite's de la ville de Paris, vol. 2, pp. 172–180. Paris: Charles Moette; Jacques Chardon. ^ Banham, Martin (1995). The Cambridge Guide to the Theatre, second edition. Cambridge, England: Cambridge University Press. ISBN 9780521434379. ^ James R. Anthony (1992), "Mazarin, Cardinal Jules Mazzarini, Giulio Raimondo ", Grove Music Online. ^ Aronson, Arnold; Roy, Donald (1995). "Torelli, Giacomo", pp. 1116–1117 in The Cambridge Guide to the Theatre, second edition, edited by Martin Banham. Cambridge, England: Cambridge University Press. ISBN 9780521434379. ^ Poncet 2018, p. 92-93. ^ Mongédien 1959, p. 256-258. ^ a b Mongédien 1959, p. 260. ^ a b c Mongédien 1959, p. 292. ^ This section draws mainly upon the essay "Le vieille homme et le jeune Roi by Jean d'Ormesson in Mazarin (1959). ^ a b Mongrédien 1959, pp. 130-143. Dethan, Georges (1977). The Young Mazarin. Translated by Baron, Stanley. London: Thames and Hudson. ISBN 9780500870044. Dethan, Georges (1991). "Mazarin, Jules, Cardinal". The New Encyclopædia Britannica. 7 (15th ed.). Chicago: Encyclopædia Britannica, Inc. pp. 979–980. ISBN 0-85229-529-4. Goubert, Pierre (1990). Mazarin (in French). Paris: Fayard. ISBN 2-213-01650-X. Mongrédien, Georges (1959). Mazarin (in French). Paris: Hachette. O'Connor, John T. (1978). Negotiator Out of Season: Career of Wilhelm Egon Von Furstenberg, 1629–1704. Athens, GA: U of Georgia Press. ISBN 978-0-8203-0436-6. Poncet, Olivier (2018). Mazarin l'Italien (in French). Paris: Tallandier. ISBN 979-10-210-3105-0. Treasure, Geoffrey (1995). Mazarin: The Crisis of Absolutism in France. London: Routledge. ISBN 0-415-014573. Bonney, R. "The Paradox of Mazarin." History Today 32. (Feb 1982): 18-24. Bonney, Richard. "Cardinal Mazarin and the great nobility during the Fronde." English Historical Review 96.381 (1981): 818-833. Bonney, Richard. Society And Government In France Under Richelieu And Mazarin 1624–61 (Springer, 1988). Ekberg, Carl J. "Abel Servien, Cardinal Mazarin, and the Formulation of French Foreign Policy, 1653–1659." International History Review 3.3 (1981): 317-329. Haffemayer, Stéphane. "Mazarin, Information and Communication During the Fronde (1648–1653)." Media History 22.3-4 (2016): 386-400. Wilkinson, Richard. "Cardinal Mazarin" History Today (April 1996) 46#4 pp 39-45. Herbermann, Charles, ed. (1913). "Jules Mazarin" . Catholic Encyclopedia. New York: Robert Appleton Company.